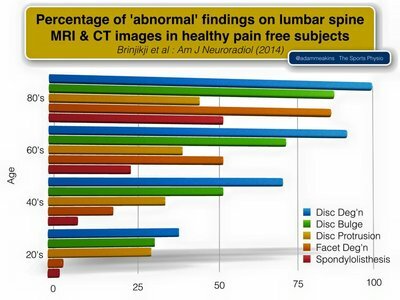 Our understanding of what the causes of back pain has improved through research over the last number of years. This has lead to treatments that are more effective in reducing back pain and disability. A Cognitive Functional approach to treatment that addresses all the factors contributing to back pain has been shown to be more effective in keeping people active and reducing their pain. We now understand that back pain is no longer just related to a local injured part of the spine. The pain that we experience is also related to other factors in our lives, what we call "psychosocial factors." Back pain occurs when the nerves report to your brain that an area has become inflamed or sensitised. Our understanding is that structures in and around the back can be injured or overloaded and this may result in some inflammation causing discomfort. Sometimes our brain overprotects us and will continue reporting pain after an initial injury has healed. 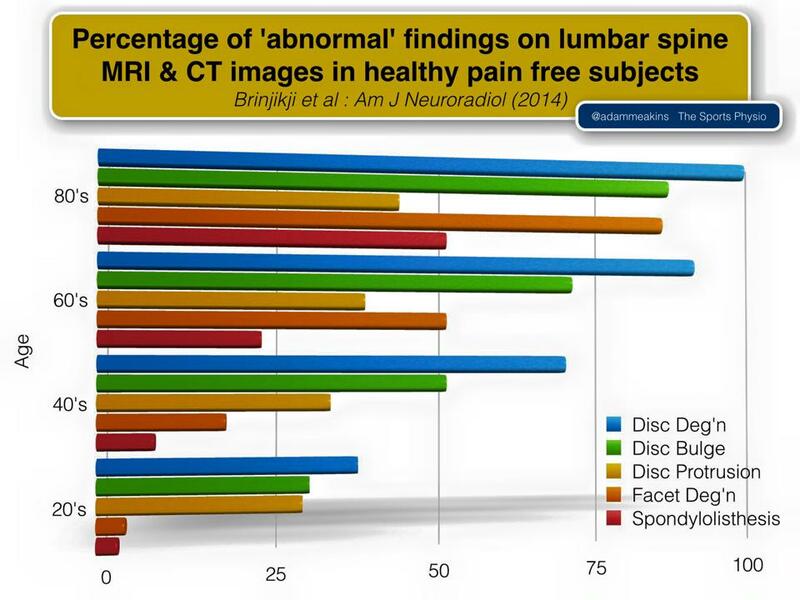 However, back pain does not necessarily always correlate with the degree of injury to a structure and a large percentage of us walk around with "abnormal" findings in our back still being able to do the things we enjoy. The following graph gives us a nice visual representation of this point. So what other factors cause back pain? Social and psychological factors have a large impact on how you respond to a low back pain episode. The cognitive functional approach addresses all these factors to help people achieve long term back pain relief. So what can I do about my back pain? Relative rest in the early stages is beneficial, however, continue to do what you feel capable of managing. Over-the-counter pain-relieving medication has not been shown to be of any added benefit over placebo. Ice packs or warm packs. Move in any positions that you are comfortable. Gentle exercises to strengthen the back. Gentle walking program as pain permits. What treatment can I get for back pain? The current research does not necessarily support manipulative "hands on" techniques for long term pain relief. However, some of these treatments have been shown to provide a short term benefit. There is also little evidence to support the alternative therapies as well as spinal fusion for chronic back pain or injection therapy and some medication including panadol. Keeping active and addressing all the psychosocial factors have been shown to give the best back pain relief and return to daily activities. Our clinic uses the Cognitive Functional approach for long term back pain relief. We do a full assessment to get a clear understanding of your situation, covering all aspects of what we know causes pain and injury. We develop a holistic program to address all the factors to enable a full recovery. We integrate a functional conditioning program to get you pain free and back to sport and physical activities. ABC report on this approach for back pain.